A top steak-based restaurant with a lot more up its sleeve, Karoos Cattle and Land is a family friendly, casual way to enjoy South Africa's finest beef, traditional fare and choice of vegetarian dishes. For beef connoisseurs the restaurant is famous for its premium red meat with extra-large steaks and full delicious ribs - you will not be disappointed. Of course, there are fantastic choices of poultry as well, with a favourite being the flame grilled Piri Piri chicken. Choose from the homemade boerewors (South African sausages), secret recipe flame-grilled lamb chops or lots of other uniquely South African dishes such as bobotie and tomato bredie. The Vegetarian choices are just as delicious with a range from macaroni cheese, vegetable fritata to spinach and feta baked potato. 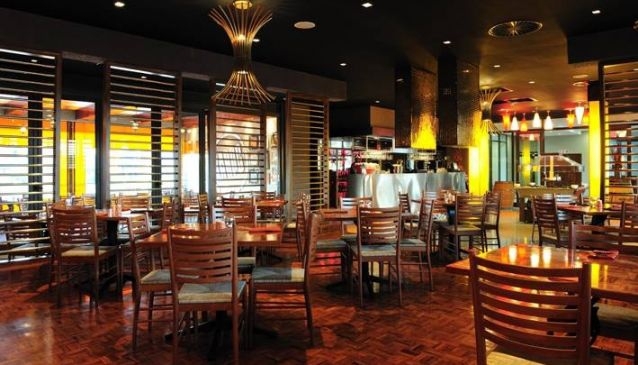 With a trendy décor of cobra black polished wall finishings the Karoo Cattle and Land is the perfect place to bring your family, enjoy a meal with loved ones and take in the fantastic food that is made with a distinctively South African touch.